The Golden Hawks men’s basketball team got themselves back into the win column for the first time in 2015 this last week, splitting a pair of matchups to move them to 5-9 on the season. Coming off five consecutive losses, Wilfrid Laurier University was in dire need of a boost when the Waterloo Warriors, the team against which they had last tallied a win, came to visit Wednesday morning. As the gym was filling with elementary school students from the Waterloo area for the school day game, captain Will Coulthard led his team on a torrid start versus the rival Warriors. Laurier jumped out to a 10-point lead in the first quarter on 71 per cent shooting. “Both teams came out and played hard,” said head coach Peter Campbell. The Golden Hawks cruised through the second and third quarters, continuing to give the young fan base much to cheer about and extending their lead to 20. However, once the scoreboard switched to the fourth quarter the Warriors collected themselves. Guard Myles Charvis diced up the Laurier defence, collecting 15 of his game-high 37 points in the quarter and helping to reduce the Golden Hawk lead to a much less breathable six points. “We valued the ball really well until the fourth quarter. They put a little pressure on, we got nervous, we turned it over six times in the fourth quarter and that let them close the gap again, and that made it a game,” said Campbell. Despite the shrinking gap, the Hawks held on and punctuated the explosive win with a Kyrie Coleman dunk in the closing seconds. After the game, Coleman, who contributed 18 points and 10 rebounds, spoke about what the school day game means to the players. While all involved were pleased to return to the win column, possibly the most thankful for the team’s success was their coach. “I might sleep tonight, I haven’t been sleeping very well for a while now. So maybe tonight I’ll get a good night’s sleep. For the guys, it’s got to feel great, it takes a load off,” said Campbell. Despite being well-rested and re-energized, the Golden Hawks were unable to parlay it into a win when the team hit the road to visit Lakehead University Saturday night. Will Coulthard again stepped up and attempted to will the Golden Hawks past the 8-6 Thunderwolves, putting forth a 29 point effort on 48 per cent shooting from the field. 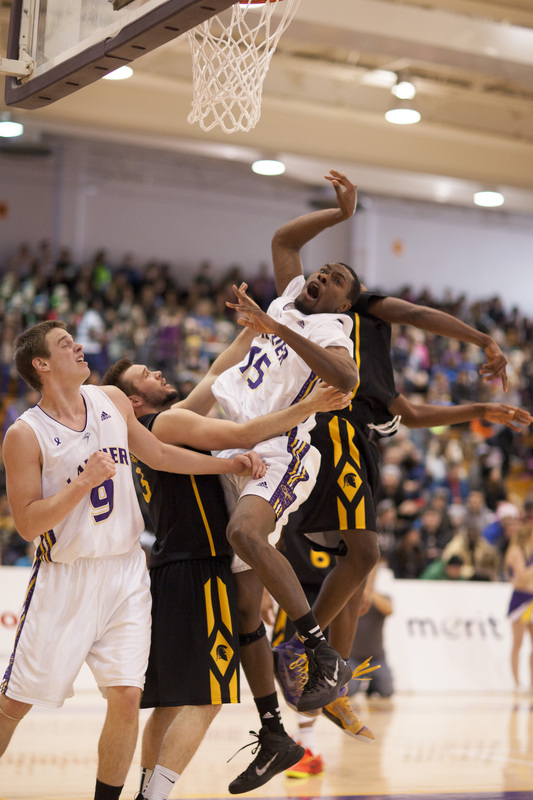 Despite their captain’s performance, Laurier attack never really gelled, leaving Coulthard and freshman Chuder Teny as the only Golden Hawks to score in double-digits. According to Campbell, the inability of the team’s forwards to produce when it mattered cost them in the 86-82 defeat. “I think we got beat inside. Their post players outplayed our post players and that was disappointing because I think that was a good matchup. I thought they were more aggressive to the loose balls and more aggressive defensively,” he said. Coulthard, who is at present riding a five-game streak of scoring 18 or more points, had his efforts lauded by his coach. “I think he’s been fairly efficient of late. Some nights when nobody else is playing he puts up more shots than he should because he puts the pressure on himself,” said Campbell. “I’m just playing with confidence, I’m just in my groove, shooting well, trying not to force anything and just play my game,” Coulthard added. The Golden Hawks will next play when they host the 1-14 Algoma Thunderbirds who most recently fell 87-46 at the hands of the Carleton Ravens.